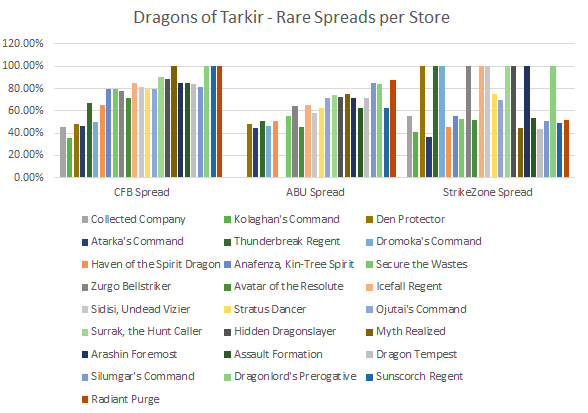 This week I’m going to take a look at the spreads on top cards from Tarkir block to see if there are any interesting trends that should be noted, especially since Magic Origins has been released. Negative Spread – There are two types of negative spread, Natural Arbitrage and Market Force Arbitrage. Natural arbitrage is the difference between one store’s demand of a card compared to another store’s demand. Market force arbitrage is when the market value of a card’s price is lower than a specific store’s buylist. Market force arbitrage lasts shortly but can be more profitable. Natural arbitrage is something I’m more inclined to analyze because this gives us enough time to pick up as many copies as we’re willing to invest in a card before the market corrects itself on the price. Market force arbitrage might make great sound bites on Twitter, but natural arbitrage is going to give you the most value over time. When looking at the mythics, I am shocked at the amount that are $2 or less retail. When looking at buylist prices the highest buylist offering on any of the mythics from Khans is Sorin, Solemn Visitor at $5. This tells me that there is definitely potential in the mythics from Khans to spike once Theros rotates from Standard. The cheaper mythics are starting to get fairly close to buylist, which is is a good time to speculate. The mythics have a fairly linear decline in buylist prices the cheaper they get in retail, which means that right now the retail price of the mythics reflects their actual demand in Standard. Many of the mythics have power but just haven’t found a home in a deck yet. Cards like Wingmate Roc have previously shown that they can be excellent in Standard however the spread is still rather high. Many financiers, including myself, believe in the power of See the Unwritten due to the announcement of Battle of Zendikar and the expected spike in price once massive Eldrazi are revealed and players want to start brewing with the card. When looking at the rares the spreads become much more obvious for deciding which cards are going to be in demand in the next Standard. All of the fetchlands have the lowest spreads, which is expected considering their eternal applications in addition to being in heavy demand in Standard. I think we can say based on these numbers that besides Windswept Heath (which just received a clash pack printing) that the fetchlands aren’t going down in price anymore. Pick up your copies now if you want them at their cheapest. 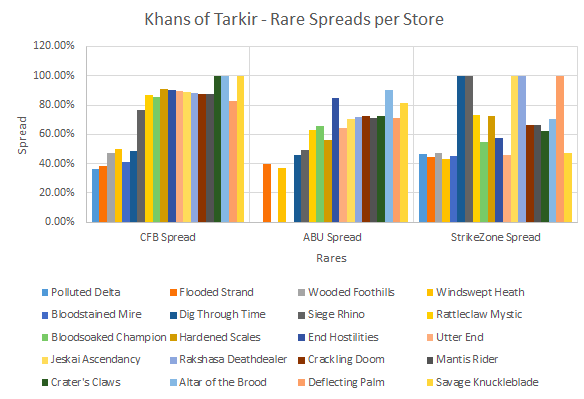 The next five rares that have the lowest spreads in general are Dig Through Time, Siege Rhino, Rattleclaw Mystic, Bloodsoaked Champion, and Hardened Scales. The first three cards are going to be great in post-Theros Standard however Bloodsoaked Champion and Hardened Scales is an interesting to see in the top five lowest spreads. Both cards must have significant casual demand. Hardened Scales is a sleeper favorite among many in the mtgfinance community for being a great long term pickup. Unfortunately, Bloodsoaked Champion had an event deck printing so the price cap is going to low on that guy moving forward. 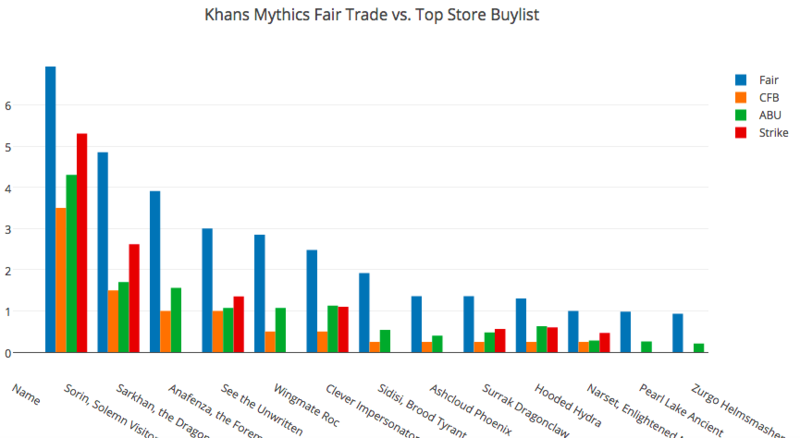 While Khans had a more defined linear decline in rare prices, Fate Reforged has a much more drastic decline in mythic prices with Ugin leading the pack as one of the most expensive mythics in Standard. 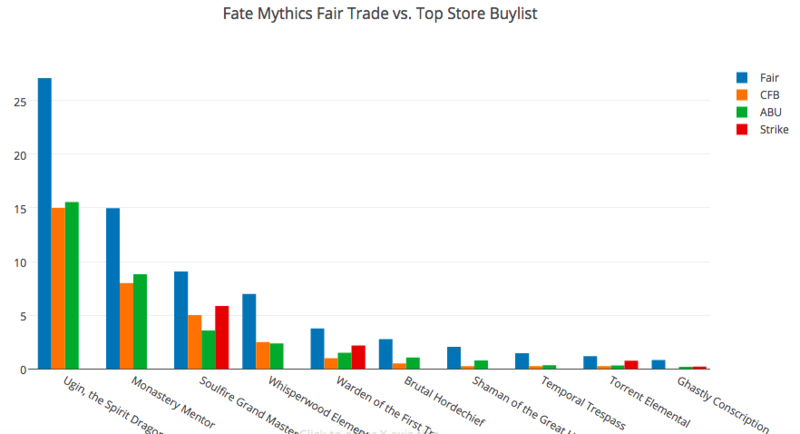 Fate Reforged mythic prices more accurately represent what I expect when looking at mythics since more than half of them have a fair trade price above $2. Spreads on Ugin, Monastery Mentor, and Soulfire Grand Master are all favorable right now across large retailers. Whisperwood Elemental has a higher spread however it could still be a great card moving into the post-Theros Standard. Cards with higher spreads that could still see a reasonable amount of play include Warden of the First Tree, Brutal Hordechief, and Shaman of the Great Hunt though depending on how Standard shakes out these could also be misses based on current store demand. 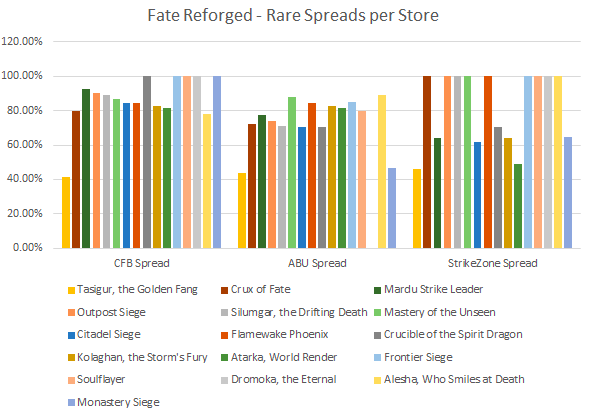 Besides Tasigur, all of the rares in Fate Reforged have insanely high spreads right now. Tasigur is starting to climb up in price so like Khans fetches now is the time to get in on cheap Tasigurs. Many rares are super cheap though like Mastery of the Unseen. Like Khans mythics, there seems to be potential in the rares of Fate Reforged since so many of them are below $1. Finally, looking at Dragons of Tarkir we see that prices are still rather high across the board for the various mythics within the set. The mythics are in this set are much more in demand than Khans or Fate Reforged at this point. 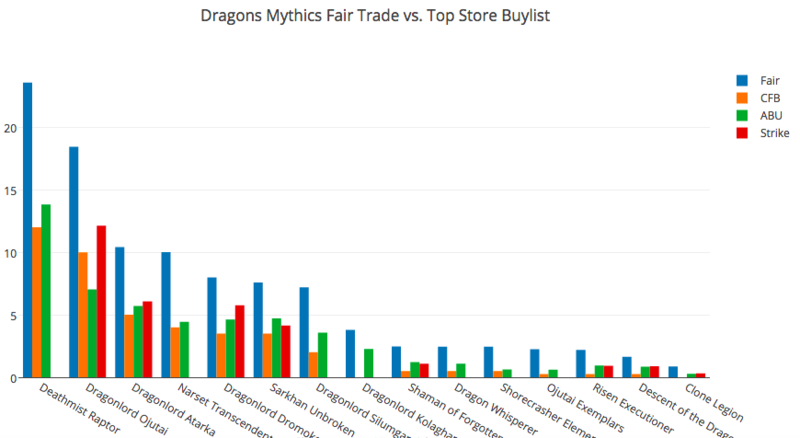 Deathmist Raptor and Dragonlord Ojutai are leading the pack, and even the five most expensive mythics are all $7-$10 retail. The dragonlords are all really popular too, which is to be expected since their Standard demand on top of causal demand will help buoy their price. Even MTGO redemption hasn’t moved prices that much yet. However, as more and more people continue to redeem throughout the year the prices should continue to drop. No spreads really pop out to me as something that needs to be watched closely. Top rares have more room to drop than mythics. Again, the event deck has capped Collected Company and Dromoka’s Command, while cards like Kolaghan’s Command and Den Protector have a tiny more room to drop as the summer goes on and Dragons continues to saturate the market. Again, like the mythics, nothing really pops up here yet as a cheaper card with a low spread, so the best way to get in on Dragons rares moving forward is going to be watching results closely to see where Magic Origins is taking Tarkir block cards. That’s my analysis so far of Tarkir Block spreads. Where do you all see Tarkir block cards going based the data, or even your own observations? Magic Origins was released last weekend and the results are already shaking up the format. Plenty of Origins cards are moving one way or the other so which cards are you picking up outside Origins that reflect the new Standard format? As always, I love hearing from you guys in the comments. Very interesting article! I watched the SCG Open closely and loved the new brews! And I really liked Jace there. He was totally undervalued by a lot of players, so I decided to move in on a Playset für 10€ a copy. Right now he as at about 16€, but I don’t know, if he’ll continue to climb without a Top 8 appearance. Interesting Info. For me, I think it is a confirmation to me that even online stores view Sorin as a solid pick for KTK block. Insanely good work man! I’ve been in love with Sorin since he was printed and every time I tell an Abzan player to put him in their deck they thank me. The shocking thing people don’t realize is it only takes him 3 turns to trigger his ultimate and possibly lock out the opponent. And his +1 on Siege Rhino and friends is incredibly valuable. When Stormbreath Rotates Wingmate Roc might have life again in Abzan but Languish is a real problem. I don’t think there’s value left in Khans other than the obvious fetches, I do like Sorin and Sarkhan for $5 is a joke, I’m starting to buy in. I’ve been running him as a 1 of with 4 Stormbreaths and will run at least a second after rotation. Plus Sarkhan gets around Languish and Downfall rotates out (that leaves only Abzan Charm as an answer or creature combat/direct damage). I like all the walkers at these lows because with Downfall rotating (my friends and I are actually not 100% sure it won’t be reprinted in Battle) people are going to realize that a 7 Loyalty Narset is SUPER tough to get rid of. None of these walkers are Kiora or even Xenagos, they have high loyalties that don’t die to just one burn spell!! And there’s no more free burn spells aka Stoke. Somehow Tasigur is going up in price (possibly modern and eternal appeal driven) because he doesn’t pass the Roast or Ultimate Price test in Standard and he only shows up as a 2 of in some builds. I thought he would be reprinted in the clash pack and with Dragon Control not utilizing Taz I stopped buying when he was $5 out of fear…I was wrong 🙂 I’m trading for Taz but I don’t see him ever spiking hard during Standard…I don’t mind being wrong again tho. Ashcloud Phoenix seems really solid as he requires 2 pieces of removal to get rid of (except Abzan Charm…which seems amazing without a pro-white Stormbreath around), the problem is that he doesn’t really have a home. He’s been a 2 of in GR dragons but that deck has switched to GR devotion…maybe he finds a home in Temur as a 4 drop after Knucks with both Sarkhans at 5 ? Ashcloud seems to have a little Prime Speaker syndrome and with dragons and eldrazi I don’t see it changing much although it is a solid card. As I’m typing this there’s 2 things I’m thinking of for post-rotation standard: 1. Abzan Charm will answer EVERYTHING worthwhile except walkers and if not there’s Utter End back up, 2. Countermagic like Stubborn Denial, Silumgar’s Scorn, the new X counterspell, and Disdainful Stroke will be extremely important. So the easy thing to say is that Abzan cards will continue to do well and may see a spike (except Siege Rhino) and maybe Jace, Icefall Regent, and/or Monastery Siege become popular (which would push the price of Dig, which should have a higher non-foil price). I could go on for forever but that’s plenty. So the short answer is foil Abzan Charm and the Walkers are the best specs. Den Protector engines will be great (when r they going to include Grim Haruspex?) with or without mastery of the unseen. If graveyard strategies exist Jace with be a 4 of instead of Wayfinder at 2 (which is a downgrade for Sultai and Taz fans, but I feel like I’m forgetting a card that was just printed in Origins so I could be overstating). A real long shot: Monastery and Outpost Sieges see play in either Temur or Jeskai Builds. With Temur it’s super easy to turn on ferocious for Stubborn Denial to prevent Dromoka Command blowouts. Good insight on Sarkhan and the other Khans planeswalkers. They seem like great pickups to me, just be wary that they don’t get the dreaded event deck printing! I’m being heavily persuaded with your line of thinking on Abzan Charm. I think it could easily sustain a price of $1 or more once rotation happens. It’s kind of a catch-all spell that is essential to Abzan strategies especially with Hero’s Downfall rotating. I’ve also always liked Ashcloud Phoenix as a pickup. However, I’d much rather put my money into something like fetches and know that they’re going to up. Finally, Languish is going to be interesting as you say. Many cards will have to pass “the Languish test” in order to be played successfully. Cards will be probably be made, or break, on the back of that card. FYI, I’m tracking a foil playset of Monastery Mentors on ebay currently at $222 with 3 hrs left. I know you said you were getting yours for $40 each and I picked up playsets around $130… is the spike just starting signaling a good long term investment or flip now? Yup, that’s exactly what I expected to them do and I expect the new price to stick! Wow, looks like the price increase is starting to happen!